Back in 1866, Jack Daniel’s became the first registered distillery in the United States; today, it’s the top-selling American whiskey in the world. 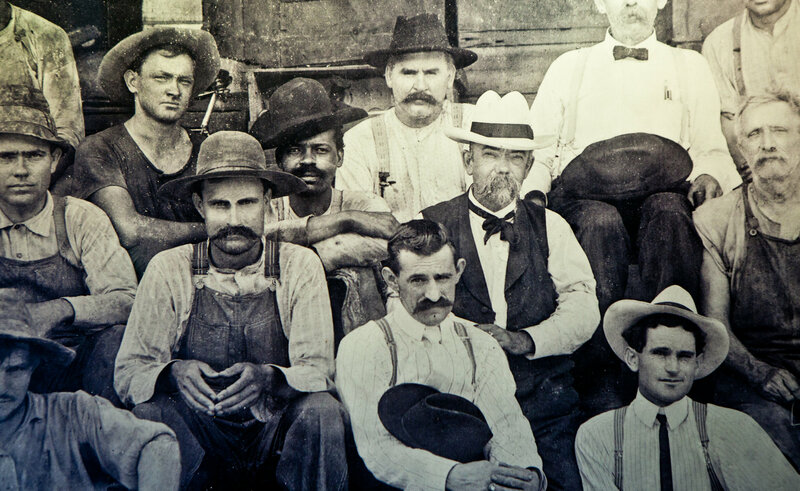 For much of the brand’s 150-plus years, the story went that the young Jack Daniel learned his trade from a pastor named Dan Call. In reality, he was taught to distill by an enslaved African, Nearest Green, whose contributions had been written out of history. In this episode, listen in as Fawn Weaver, the entrepreneur who has made rediscovering Green’s story her business, and Clay Risen, the whiskey expert whose 2016 article in The New York Times launched Weaver’s quest, tell us the true story of Nearest Green and Jack Daniel—and of American whiskey. This photo from the late 1800s—one of just a handful that show Jack Daniel (with a mustache, necktie, and white hat)—also shows Nearest Green’s son, sitting at his right-hand side. This episode, we follow Weaver as she tracks down Green’s descendants and pieces together the true story of his relationship with Jack Daniel. Ultimately, her research reveals that Nearest Green not only taught Jack Daniel how to make whiskey, but was, in fact, the first master distiller for Jack Daniel’s Distillery, and thus also the first African-American master distiller on record in the United States. But how did Green get written out of history? And what was his role in shaping the unique flavor of Tennessee whiskey? Listen in now to hear this long-forgotten story that lies at the heart of one of America’s most iconic brands. Fawn Weaver is an entrepreneur, investor, author, and co-founder of the Nearest Green Foundation. You can read more about her research and the projects she is undertaking to honor Nearest Green’s memory and legacy here. She is also working on a book and movie about the life of Nearest Green, and you can find links to stores that stock her multiple-award-winning Uncle Nearest Whiskey here. Gastropod’s fairy godmother! Find out more, including how to apply, here. The post The Secret History of the Slave Behind Jack Daniel’s Whiskey appeared first on Gastropod.